Levesque's Gate to Anime: Anime Review : Ore Monogatari! 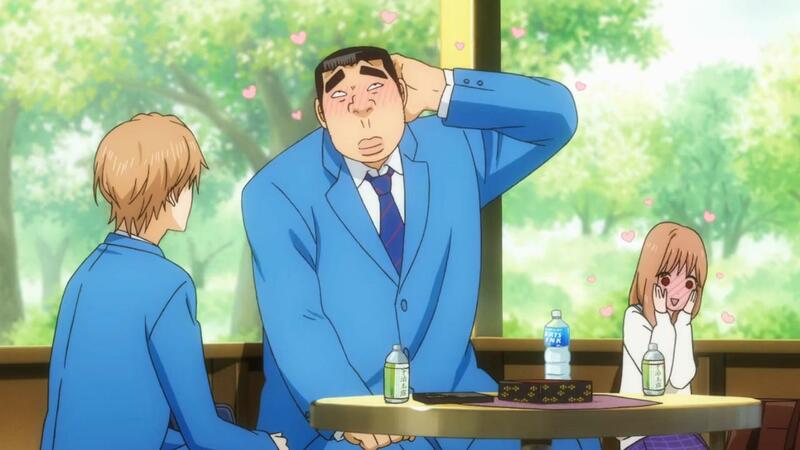 Anime Review : Ore Monogatari! Ore Monogatari! 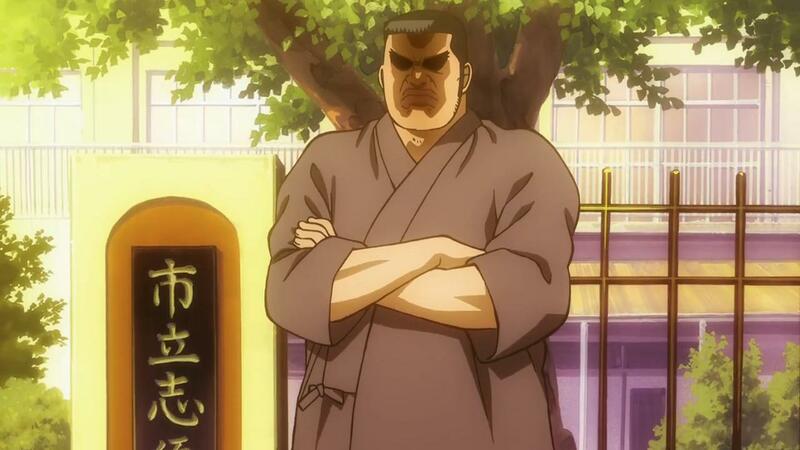 is a romance anime series that stars Gouda Takeo, a man with a hulking figure, as the protagonist. All the girl that he loves always falls for his best friend, Sunakawa, until one day he saved a girl from a groper. Don’t mind the class-act my version of the synopsis above, okay. And of course, everything pays off, even at the first episode. The episode starts off with Takeo, who’s about to graduate from middle school, is going to confess his love to a girl, only to find the girl is confessing to his best friend, and got heartbroken. Then, Takeo proceeds to narrate some little things about him and Sunakawa, as well as his previous love. Until later he saved Yamato Rinko from a groper. I’ll delve into that later, that’s just for the prologue. From the very first episode, Takeo is immediately recognized as the ‘gar’ of the story while Sunakawa is the bishonen of the series. This combination worked wonders as the story progress. Sunakawa’s charming appearance with Takeo’s gruff but strong style has an unique chemistry that makes them a good friend and enjoyable to watch. Everytime they interacted with each other, I can’t help but either laugh, or be filled with emotions thanks to their bromance. Back to the story, after being saved, the thankful Yamato finds out where Takeo lives and became friends with him, two episodes later, she confessed her love to Takeo [Thanks to Sunakawa’s tactic] and then the two of them become a couple. The problem is… This is a romance genre and that confession, at the third episode, is a tad bit too early. At the first episode, I thought Takeo is going to be the one who confessed his love to Yamato and it was going to be around episode 6-7, but for that to happen as early as episode 3 came off as surprising and well, a little bit of let-down. 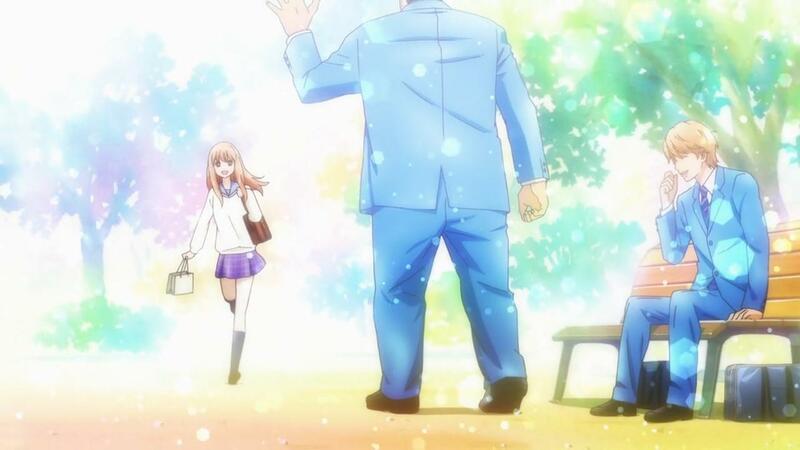 However, Ore Monogatari! never regrets any decision it makes and continues to defy the odds by making more eccentric choices as the story progress. The early confession is the one that Ore Monogatari! never looked back and instead, they embraced the idea. Later, the story progress with how Yamato and Takeo became an even closer couple. Watching the two of them grow as a couple is enjoyable, even at one point, I regretted saying that the confession was too early. So, instead of seeing how the two of them get close enough to later become an official couple, we are, instead treated with how they would be close AS a couple and how they interact with each other AS a couple as the series progress. Now that’s something I rarely see in a romance-genre anime. And as the story moves forward, I slowly embraced the idea. I don’t want to spoil more story but maybe I’ll do it later, I’ll just point out several important things from here on out. The animation is good but not excellent, since there are some times when Ore Monogatari! repeatedly uses a same scene, but overall, the animation is good. Characters are also cute and well-drawn, especially Yamato and her friends. Takeo and his friend [With the exception of Sunakawa] looks goofy but they have their own charm that makes them enjoyable to watch. The plot moves little by little and most of the time, it follows a two-episode pattern, where one episode tells the problem and the next episode resolutes it firmly with no strings attached. This formula worked wonders for Ore Monogatari!, since this formula is combined with a very interesting choice of story. Unfortunately, there are a few episodes that doesn’t really hit the mark and I thought those were just unneeded episodes. 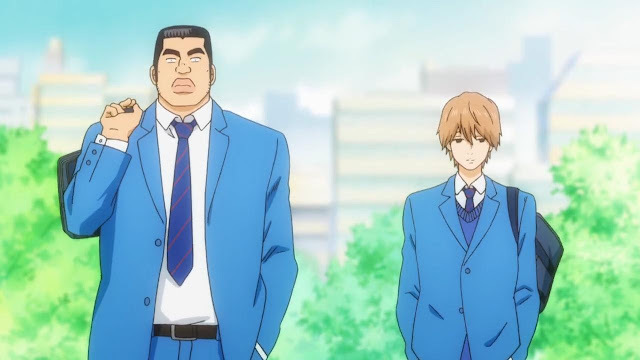 Take for example episode 7, where Takeo is recruited by the Judo club to help them win a friendly match with a rival school and later, he faces an old friend. 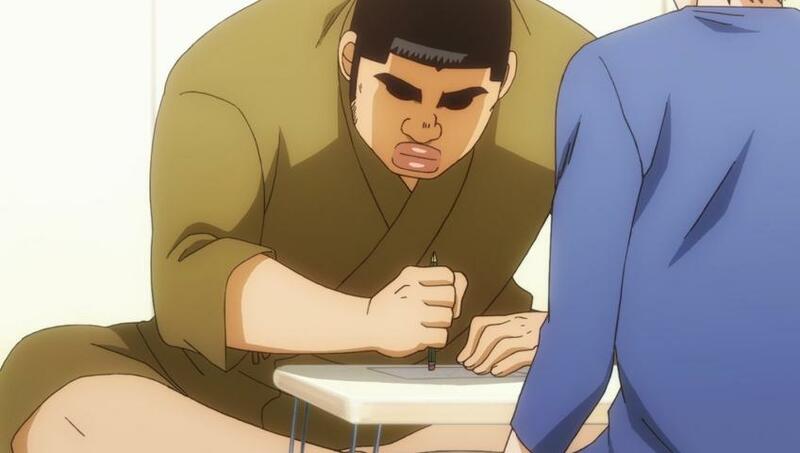 Perhaps this episode is meant to show that Takeo is so good hearted that he is willing to help the Judo club and maybe we get to see a little bit of development between Takeo and Yamato, but the judo club, after this episode, is never mentioned again and his old friend never appears. This fails to establish anything whatsoever and as for me, it felt just like a waste of an episode. This is reminiscent of Pokemon’s character of the day and well, I don’t really like the concept one bit. Of course, the judo club episode is the last episode that follows the old formula, and starting from episode 8, the new formula of 2 episode pattern with unique choices is here to stay. The music is fine. Not good, not bad, just fine. I think the ending song is catchy, but it was too short. The instrumental music behind every conversation or action just never click and sounded bland to me. The background, on the other hand, is colorful. The main setting is the city, but there are times when the story presents Mountain, Ocean, Zoo and among other thing as the background. Unlike some anime, the background of Ore Monogatari! constantly changes since they never went to the same places [With the exception of their home, mini-market, and café]. This is unusual for a comedy that has a setting of the city, but as usual, Ore Monogatari! makes that decision and it pays off quite well, since I enjoyed everytime they go to some places. 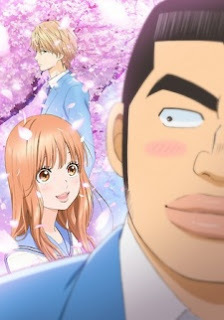 The genre Romantic Comedy / Rom-com also falls into this genre and quite frankly, since Takeo is so big and a protagonist like him is like a breath of fresh air, almost all the jokes that came out of him is so fresh. 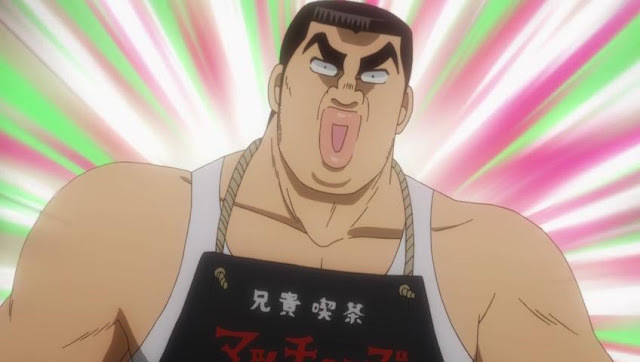 His reaction is so funny to see and observe and despite Sunakawa being his sidekick, Takeo is the source of comic-relief for the entirety of the series. Either it’s his superhuman power or his antics, it’s always fun to see Takeo in action. Takeo as the protagonistof the story, is like a breath of fresh air. Just look at that goofy outfit. There are number of female character that appears in this episode, such as Ai Sunakawa, Sunakawa’s older sister who is in college.Nanako, Yamato’s friend who would later become Kurihara’s girlfriend.MariyaSaijou, a girl who has a crush on Takeo. And AmamiYukika, a girl with an obsession to Sunakawa. Out of all of them, the one whose storyline I truly enjoy is AmamiYukika. Sure, her obsession towards Sunakawa is creepy [Save for Takeo, who doesn’t understand], but her love for him is genuine. And the way she almost given up for Sunakawa is really emotional until later, Takeo told her not to give up and face Sunakawa clearly, who seemingly rejected her, though his voice was blurred so that we do not know what’s he saying when he rejected Yukika. Either way, her story is good. An episode removed from Yukika’s arc, we are treated with the most story-driven of the series. During this entire 20 episodes, we are treated with how girls always falls for Takeo or Sunakawa. But, what happens if there’s someone who actually falls for Yamato? Enter Kouki Ichinose, a handsome pattisier who works at a small but famous bakery. Yamato works in that bakery and later, after Yamato supported the former to sell his cakes, he thought Yamato had fallen for him, while that clearly isn’t the case. And after Yamato told Ichinose that Takeo is his boyfriend, he ran to him and immediately told him to break up with her. That sounds unreasonable until he gave his reason, which Takeo still refuses of course. However, during the entire lecture, Takeo is silent and just agrees with what Ichinose said, telling Sunakawa later that everything he [Ichinose] said was correct. Later, the episode ends with a cliffhanger, with Takeo looking down, drenched in rain as he saw Yamato going off with Ichinose inside his car. After 20+ episode, we finally get to see how Takeo looks like when he feels down. It was a surprise to understand that Takeo has an inferiority complex, but it was not rare. People as kind as him sometimes has an inferiority complex and I too has that kind of complex. Sometimes, I feel that that guy is better than me, I feel inferior at times but it can be overwhelmed. 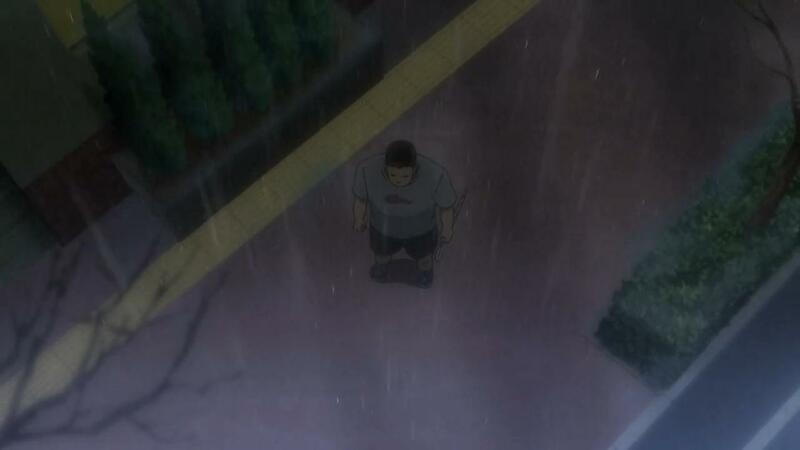 Takeo never override that, instead, he become stronger and told Ichinose he won’t let Yamato go. And afterward, the series ends. It feels incomplete but having it run for over 20 episode is really a wonder. Perhaps it’s another choice that Ore Monogatari! is making and it pays off. And with it, Ore Monogatari! closes with style. The main characters came out fresh. Takeo, being the hulk of a protagonist.Sunakawa, being the sidekick bishonen.And Yamato, being the protagonist’ loving girlfriend. The rest isn’t as fresh as those three and isn’t as memorable as them, especially Ichinose, who came off as a jerk to some viewer I think. Of course, my pick is Takeo, who I can really relate with myself. It’s rare to see a guy like him to be the protagonist and It kinda warms my heart to see him everytime he acts. For me, an anime with the tag of Romantic-comedy should make you laugh and go ‘aaww’ at the same time. Ore Monogatari! manages to make us do just that. Sometimes, Takeo’s antic with Yamato are so funny that we can’t help to laugh but at the same time, says ‘It’s so sweet’. I’ve grown a habit of everytime watching Ore Monogatari!, I would predict when Takeo would say “I love her! / Sukida!” in his mind with a very funny-looking faces and it’s always funny and enjoyable. Overall, Ore Monogatari!! is a fun anime series to watch. Almost every episode keeps me on the edge of my seat. It has the potential to be good, but it kinda missed out on it with a few flaws, such as the music and some bad-picked choices. However, like I said, the daring choices the series makes is what makes this such a fun roller-coaster to ride. The good : Most of the material is fresh. Main characters are memorable. Daring choices pay off big-time. An example of how Romantic comedy should have been done. The bad : Animation seemed stiff at times. Some episodes feels like an unneeded extra. Cast, aside from the main character, looks bland. When a choice didn’t pay off, it hurts.Ending is lukewarm. Personal note : I am almost finished playing Persona 5. Expect a review to come out in a week or so.